Apophenia is a generative software art work programmed in Processing. The work was created to run on a mac mini and HDTV installed in a gallery. The video at the Vimeo link gives an idea of how the software drawing machine looks while running, but the real thing is non-looping and changes with each iteration. Apophenia is from a recent series of generative art works. Even though it is a time-based work that evolves countless iterations of animation, I refer to it as a drawing because it consists primarily of simple graphic line work on a solid white ground. It was also important to me that the line work and patterns closely reference my drawings done in ink on paper. The work has five segments that occur in random sequence and each of the segments has random variables that make individual iterations unique but recognizable as a member of a segment group. The process of writing the program was heuristic in nature and involved experimenting by joining small blocks of code, setting up some parameters, recording ranges of random variables and watching the resulting animated drawings to observe the behaviors of the lines and the interactions between the forms. 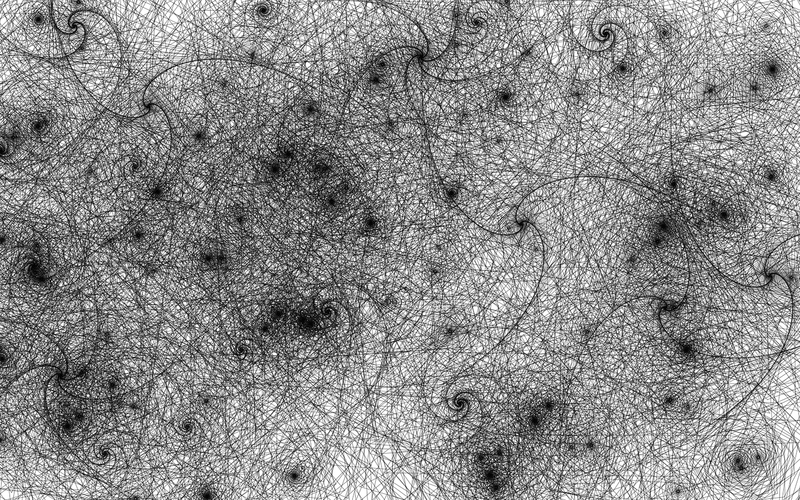 By selecting ranges of numbers that resulted in forms that I responded to visually and introducing some noise in the coding, I was able to create this series of generative drawings that reflect my own pen and ink drawings on paper and early drawing machine experiments in the history of computer arts. Nicholas Economos lives near Big Flats, New York. His art practice includes software art, responsive media art, sound, video, and animation. He is an Editor Emeritus for Rhizome.org at The New Museum of Contemporary Art in NYC. His awards include an Individual Artist Project Grant in Film, Media, and New Technology Production from the NYS Council on the Arts; a Newcomer Award at the Darklight Film Festival in Dublin, Ireland; and an Individual Excellence Award in Media Arts from the Ohio Arts Council. He has exhibited at Currents in Santa Fe, NM; Art Interactive in Cambridge, MA; Hallwalls in Buffalo, NY; Art in General in NYC; Fylkingen in Stockholm, Sweden; Contemporary Arts Center in Cincinnati, Ohio; F.I.L.E. in Sao Paulo City, Brazil; Window Project Space in Auckland, New Zealand; Chiangmai New Media Art Festival in Bangkok, Thailand; DigiFest in Toronto, Ontario; and the Cyberarts Festival in Boston, MA. He was invited to be in the DVD anthology distributed by Electronic Arts Intermix, ” ETC: Experimental Television Center 1969–2009″. He taught media art for the Department of Expanded Media at the School of Art and Design at Alfred University and the T.I.M.E.-Digital Arts Department at The Cleveland Institute of Art.